Posh goalkeeper Matt Wilshire scored in an 18-0 win. Posh picked up three big wins in the first round of matches in the EFL Futsal Scholarship National League. Posh A thrashed Mansfield A 18-0 and Stoke City A 7-2 in their games while the Posh B team chalked up a 5-1 win over Stoke City B. All games were played at St George’s Park. 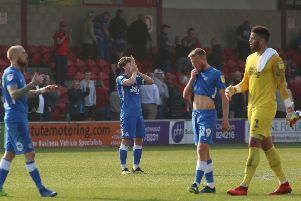 Antonio Jaquite and Rodrigo Silva were the stars of the show for Posh A against Mansfield, who struggled to cope with Jaquite’s physical prowess and the link-up play between the two of them. Silva ended up as top goalscorer, netting eight times in the two games, while Jaquite struck five times. Others to find the back of the net were: Ryan Cook (2), Isaac Saywell (2), Tyler Munns (2), Keith Mureza (2), Zach Mulholland (2), Oliver Goymour and Matt Wilshire. In the B team fixture Posh worked very well to grind out a result against a very physical Stoke City side. Jake Cooper and Tam Ltaief looked a threat every time they were in possession and both got goals. Alex Findley (2) and Oliver Baig also scored. Posh A: Matt Wilshire, Oliver Goymour, Zach Mulholland, Isaac Saywell, Keith Mureza, Rodrigo Silva, Tyler Munns, Antonio Jaquite, Ryan Cook. Posh B: Dan England, Adam Barker, Tino Renecke, Jake Cooper, Tam Ltaief, Oliver Baig, Alex Findley. Posh Futsal manager Michael Johnson said: “It was a very pleasing day for all players and coaches. “There are players in Posh B already challenging for places above and impressing coaches with their attitude and others with their matchday performances. That said o in Posh A are taking training into matches which is pleasing.